FOR IMMEDIATE RELEASE Depicting the Invisible A Portrait Series of Veterans Suffering from PTSD. Opening at HG Contemporary Gallery Nov 9 - 26 2018 in Chelsea NY Susan J. Barron’s beautiful and powerful 6x6ft mixed media depictions on canvas are achieved through photographic imagery, paint and text. Unflinchingly the veterans make direct eye contact with us. Incorporated into these photographic portraits are the veteran’s own stories in their own words. In these works, they give voice to their experience, their reality, their world. The elegance of the images confronts the brutality of the stories. Barron’s ultimate mission is not one of simplistic deification, but one of truthful illumination. This body of work is intended to not only give voice to these warriors’ harrowing, shocking, and often hopeful stories, but to create a dialogue and community around the difficult issue of PTSD. The mission is to depict the invisible scars of war and to show these brave individuals they are not alone. The mission is to end their isolation and depict them as the heroes they are. There will be a private gallery reception for veterans who graciously participated in the portrait series on Veterans Day, 2018. A limited edition art book has been published of the portrait series Depicting the Invisible. All proceeds from the sale of this book will go to Freedom Fighters Outdoors, an organization helping veterans with PTSD. This edition of only 100 books will be available at the HG Contemporary Gallery throughout the duration of the exhibition from Nov 9 - 26 for $150. 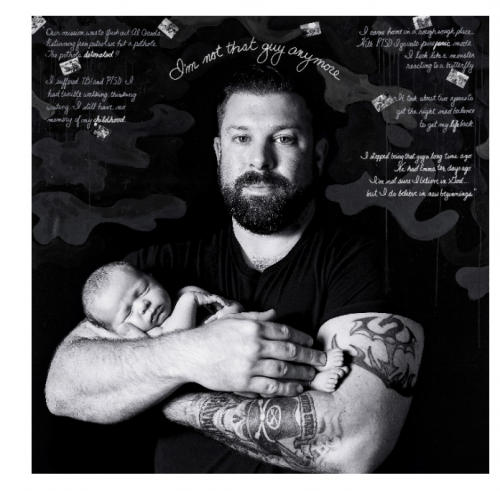 Twenty of these books will be signed by the veterans themselves who participated in this portrait series. These special books are available for $1000 each and there are still some available. Those purchasing these signed books will be invited to meet the veterans themselves at a reception to be hosted by HG Contemporary on November 12th. It is Ms. Barron’s great hope that the veterans who generously participated in this project will find the telling of their stories cathartic, and feel they are making a difference by giving back. “My intention is to bring awareness to the issues of PTSD and to depict our veterans as the incredible heroes they are. Twenty-two veterans commit suicide every day in our country. The invisible wounds of war are just as devastating as the visible ones. My mission is to bring awareness to the PTSD epidemic and provide a platform for veterans to share their stories, and to help create a vehicle for support and change.” - Susan J. Barron. About Susan J. Barron Susan J. Barron is an exceptionally diverse, multi-award-winning artist whose work has been collected and commissioned across the country. Whether working with oil on canvas, photography, or incorporating sculpture and collage elements, Barron’s work bravely and beautifully challenges viewers preconceptions. A Table for the Fallen - An Interactive Video Project A Table for the Fallen is dedicated to Damon Zeigler one of the veterans who participated in this portrait series who lost his battle with PTSD. In this interactive work, A Table for the Fallen, visitors are invited to sit at a dining table set for one and to create a personal tribute to a fallen soldier whom they wish to honor. Each participant will be filmed ultimately composing a video piece. We invite the public to come to the gallery and lend their voice and participate in A table for the fallen. By participating in this work you have acknowledged your release to appear in the Video piece A Table of the fallen. HG Contemporary is a breakthrough gallery founded by Philippe Hoerle-Guggenheim in 2014. The gallery has built a reputation for unearthing distinct artists and producing shows that embrace groundbreaking aesthetics and concepts. The gallery is committed to developing an international contemporary program that is ambitious as well as diverse. The gallery's locations include Chelsea New York, Williamsburg, Napa Valley, and Madrid. This commitment carries with it an innovative and clear vision about producing exceptional art exhibitions as well as a deep understanding of visual culture's function within and beyond the walls of the gallery. This approach includes a digital path, which is under way.